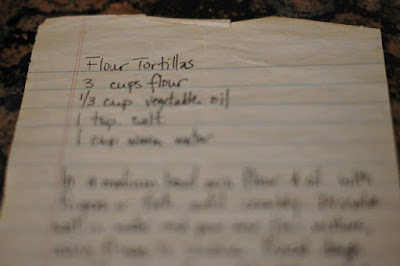 Many years ago, a friend of mine gave me a recipe for tortillas. Shannon and her husband Jason were (and still are, I assume, even though I have not seen them in quite a while now, since seminary) great cooks, and they love fun, fresh food. I wish I shared their enthusiasm for many of the wonderful things they ate, however a love for tortillas was something that I did share. What I really love about this recipe is how simple it is. There are four ingredients and they are always on hand. I don't know why I don't make them more often. I am lazy is likely the number one reason. However, I make them for the same reason, so see if you can figure that out. I have to go to Whole Foods or Central Market in order to get tortillas that taste good and do not have hydrogenated oil, and I'm just not into going to two or three stores, especially when I'm getting one item in that extra store. I don't even like to go to one grocery store, much less drive around town for tortillas. I confess that Central Market has some darn good tortillas, and they are almost worth an extra drive. Almost. Early today I decided that we should have tortillas with the meat concoction I had thrown together in the crock pot. (I really don't know if crock pot is one word, two words, or hyphenated. Personal preference, maybe?) 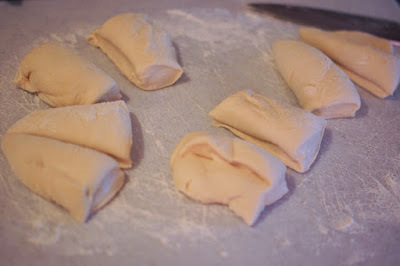 There was plenty of time to make the flour-y wonders, so I got busy. I love that it is simple, and I also love that it is written out by my friend. That makes it extra special. I measured out three cups of flour into my stand-up mixer. Do you know how to measure out flour? 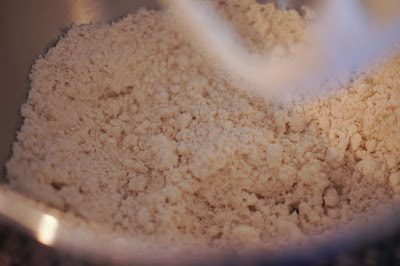 Use a spoon to put the flour in the one cup measuring cup, never shake the flour down, and then gently scrape across the top once there is a bit of a mound there. 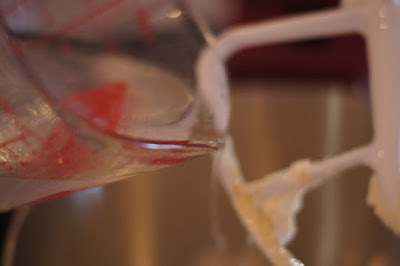 Don't shake your flour down into your measuring cup! You'll end up with too much. 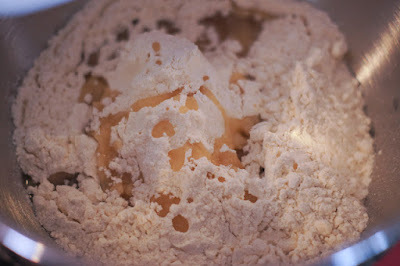 and gently mixed it on low until the mixture was crumbly. I put one cup of water in a liquid measuring cup, added some salt (I'll be honest...I just guessed on the amount), dissolved the salt, and then poured the salt water into my flour mixture. That is a terrible picture. But it's not like I could do it again. 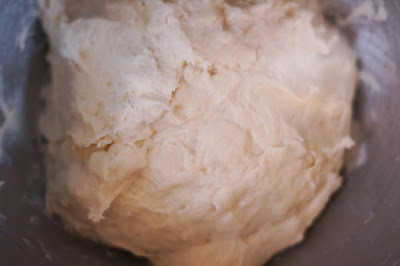 I turned the mixer back on low-medium speed and let it mix until the dough was elastic. My dough seemed very elastic-y, however, so I added a bit more flour. Probably about a quarter cup plus a tablespoon. It seemed good after that. I went to pull the dough out of the bowl and thought it was still pretty sticky. I spread a pretty decent amount of flour on my cutting board and then pulled the dough out and rolled it around a little in the flour. It seemed just right. I was so excited this was going so well. 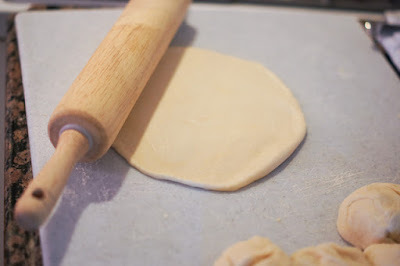 I took my big knife and cut my dough into eight pieces. 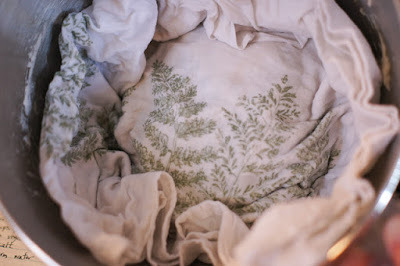 It was so soft and lovely. I could hardly wait to eat the tortillas! I rolled each one out. It was still a little early in the evening, but I thought I could get ahead of the game. I set each tortilla on wax paper, and layered them that way. I left them until the meat was ready, so that I could heat them up right before we ate. Yum! When I went to pick up the top tortilla, it was completely stuck to the wax paper. I tried to scrape it off, thinking it was a bummer, but I would just have to reroll. Nope. 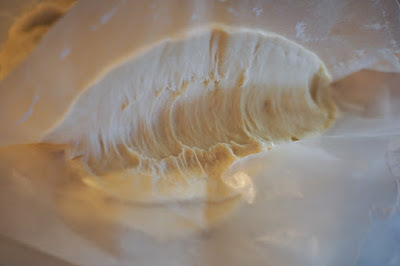 The wax paper tore, and I couldn't even tell where dough ended and wax paper began. What you see below is the top wax paper, the second tortilla, and the next layer of wax paper. Nice and elastic, though, huh? I was very sad. I had to throw the whole pile of tortillas and wax paper away. I actually had the thought halfway through my preparation,"Ha, ha, this recipe doesn't belong on 'Recipe for a Disaster'! It's going so smoothly!" Lesson: Never underestimate my ability to bring on the disaster. By the way, "casi" means "almost" in Spanish. My tortillas that almost were delicious. How white will my teeth get after 1 treatment? sup, I usually dont read these types of articles because I think the industry is falling off but you make a good point so im gonna link to this post on my site good looking! I just saw this post and despite the fact its old enough, it is quite original and worrying for me. But I hope you will post more such concerning messages there! Thank you! Very well written story. It will be beneficial to anybody who usess it, as well as myself. Keep doing what you are doing - i will definitely read more posts. The struggling part of life is remember able part of life, a person never forget that event and time in which he did most struggle, the student life is same like that, where a student have to do many efforts, he have many enjoyable activities and friends etc. Oh, no! So sad. I hope you had a bag of chips on hand. I was so excited, I know what it feels like to have a good dough. This is a recipe of life! This exact thing happened to me last week. :( Total bummer.